Wow! Australia knows how to impress you and scare the living crap out of you, all at the same time. You know, just enough so you start questioning your sanity. Enter the tour from Alice Springs to Uluru. I mean, while I am busy admiring the wonderful view, the tour guide was explaining how we had to watch where we walked because there were snakes and Australia had 7 (seriously, 7) of the world’s 10 deadliest snakes. Now go and enjoy the sights. Thank you Australia. I booked the two-day, budget tour from Alice Springs to Uluru and Kings Canyon through Emu Run Experience. I chose them because they had a budget version for accommodation that wasn’t camping. It was in an outback resort which means everything in one location. There was a hotel, hostel style dorms, camping, restaurant, outdoor buffet style eating area, laundry room, as well as various other features. 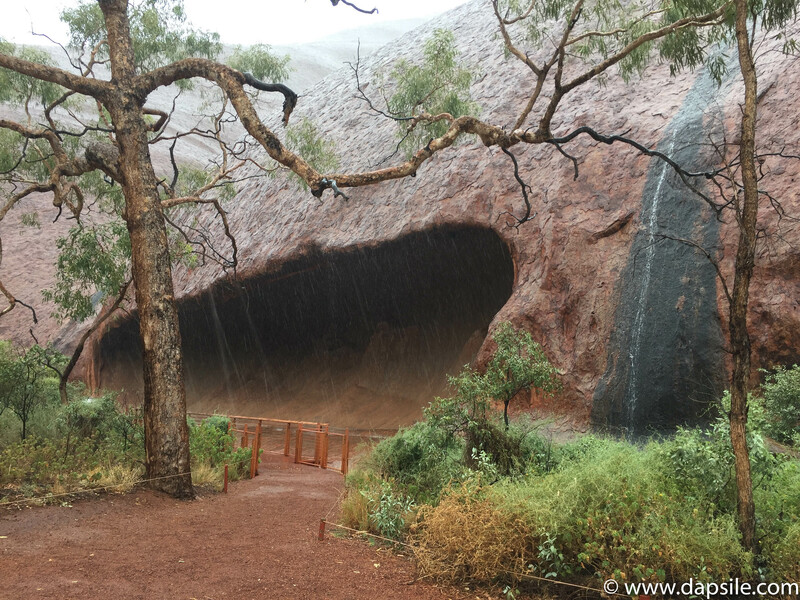 You can read about visiting the Alice Springs area here. It also contains a harrowing story of the night a cockroach planned my demise. Day 1 was with Emu Run Experiences for a tour from Alice Springs to Uluru. Both drivers/guides were knowledgeable, friendly and helpful. The day starts with a stop for an included buffet breakfast and ends with an included bbq with sparkling wine. With heaps of snacks in between. In fact, every time we stopped we were given something to eat. There was fruit, biscuits, granola bar, and gummy candies for snacks. They also had giant containers/kegs of cold water so you could constantly refill your water bottle. These are people who live with some pretty hot temperatures; they know what it takes to stay hydrated and keep your energy up. It was an early pick-up time of 6 am for me, but it also depends on your pickup location. Mine wasn’t the first, or the last that morning. You get the opportunity to sleep on the bus though until they stop for breakfast, at about 8:30, at Erldunda. 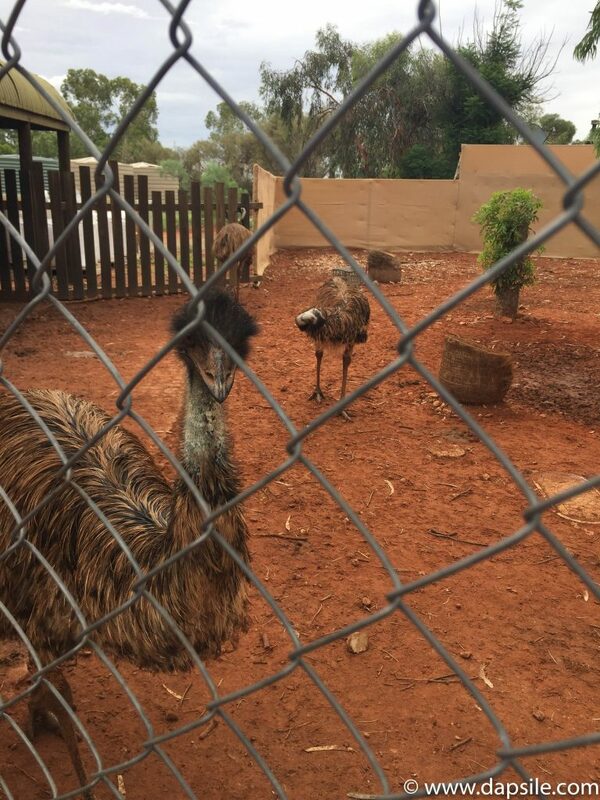 Here we were also able to use the washroom, do a little bit of shopping and even make friends with some emus. 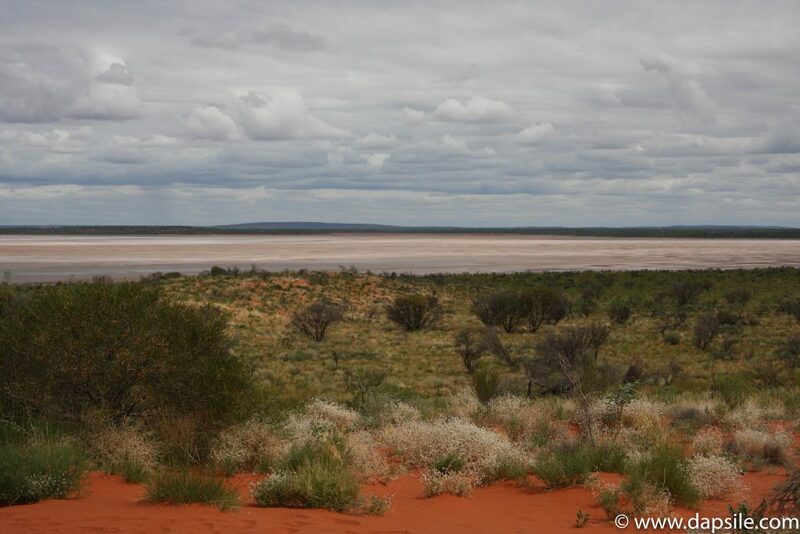 Once we were back on the bus, a 55-minute documentary on central Australia was played. I found it to be really informative and interesting even though it stopped playing the video and only had sound for more than half of it. Officially the second stop was just on the side of the road for a great picture opportunity. The next big stop after breakfast though, is Walpa Gorge. Enter the above snake conversation. 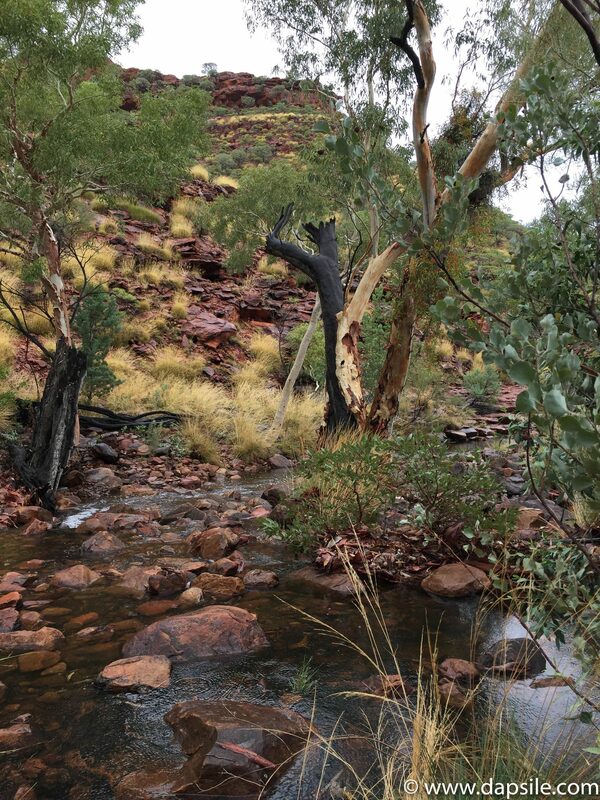 You have the opportunity to walk all, or part of, an easy 2 km return hike to the Gorge. The entire walk provides you with some great photo opportunities. 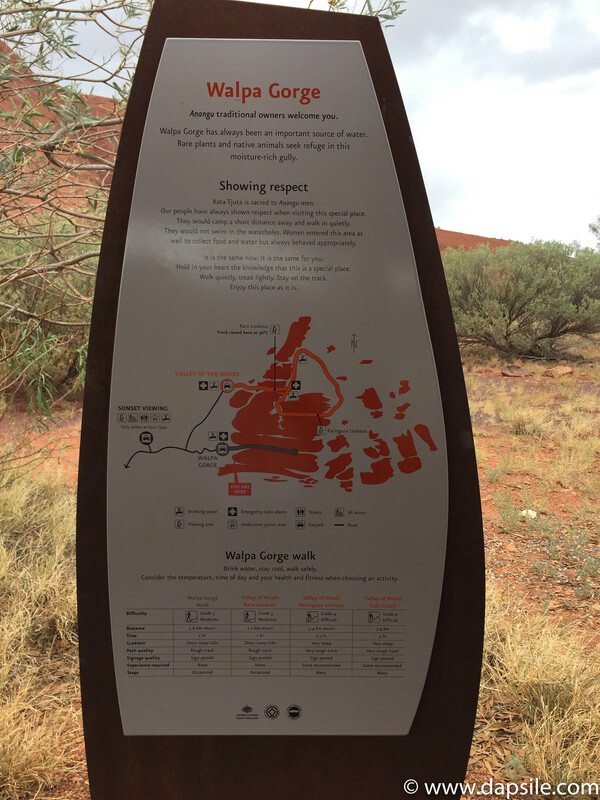 The Fourth stop was at the Uluru Culture Centre for approx. 40 minutes. The centre was wonderful. There were washrooms, a store, as well as a shop for Indigenous art. There were some amazing pieces of art for sale in several different mediums. The artist’s bios were also listed with each piece, giving you a great background of that artist. 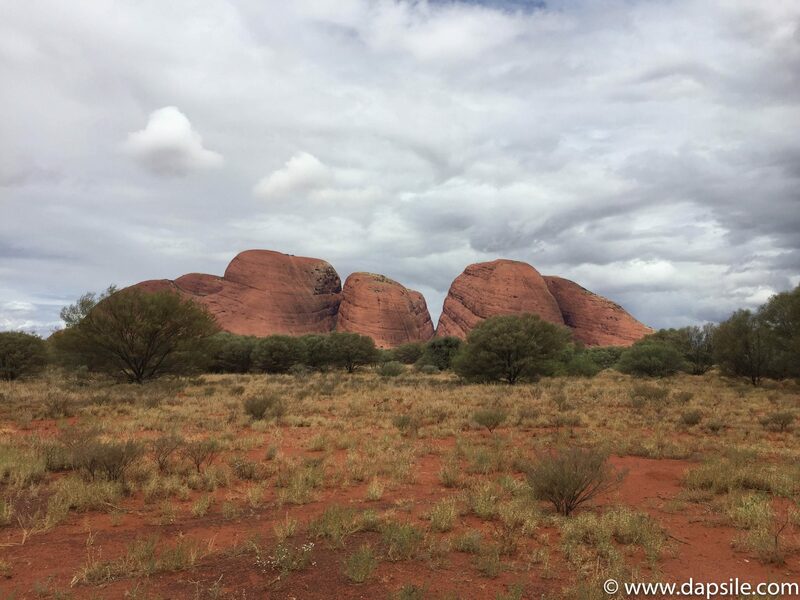 Somewhere along our drive to Uluru, we also stopped at Kata Tjuta for some great pictures. The big feature of the day. Uluru. 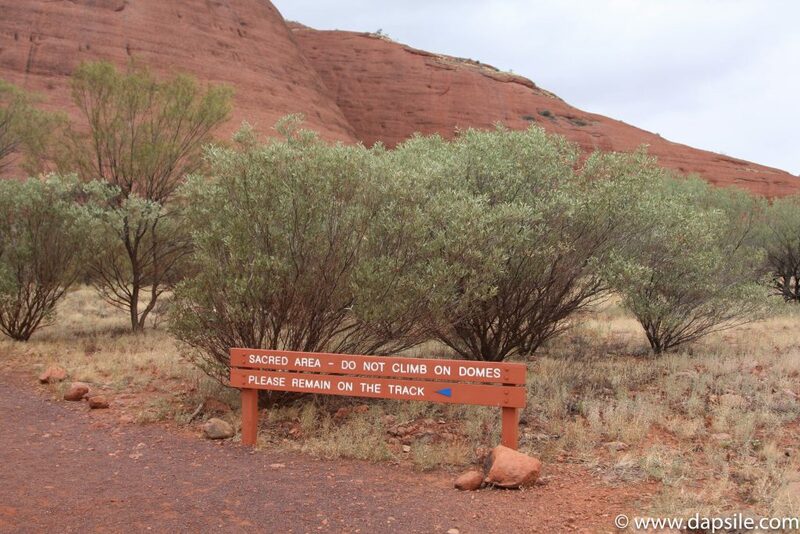 This is a very sacred place for the Indigenous people, you really have to be respectful. You are asked not to climb it, so please don’t. There are also only certain areas you are allowed to walk, or even look at. While some areas are accessible for everyone, some are only for males, and some are only for females. There are signs throughout the walk along the base that explain this. Uluru is an amazing site to see. 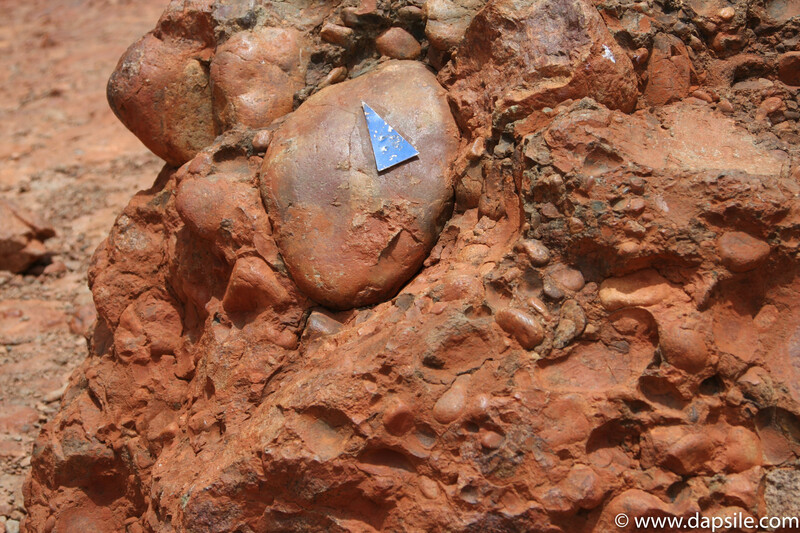 It is basically a giant, red rock in the middle of a vast space of flat, red desert. It has a way of sticking with you though. Most people I talked to that have seen it, said it was a stunning red. 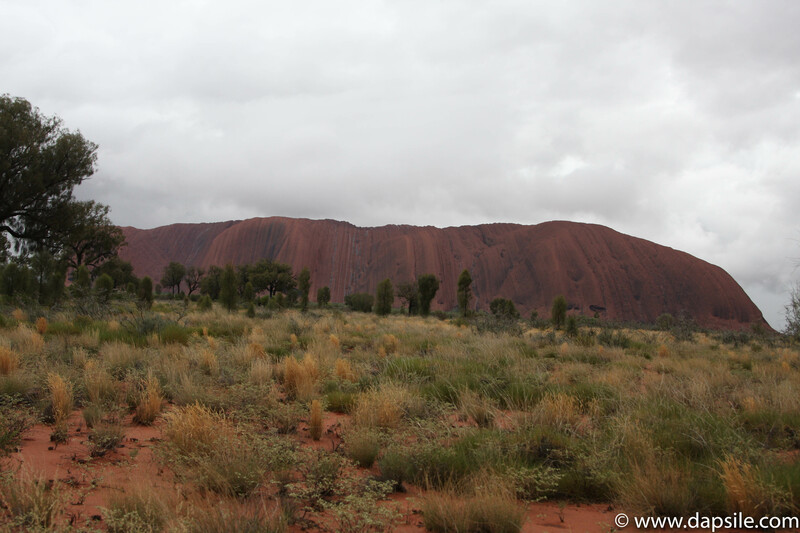 The day I was there, it was raining so the red rock was actually more of a pink/black/grey rock. It didn’t stand out in pictures but I do have a great shot of the clouds literally devouring it. The walk is easy, it’s flat. 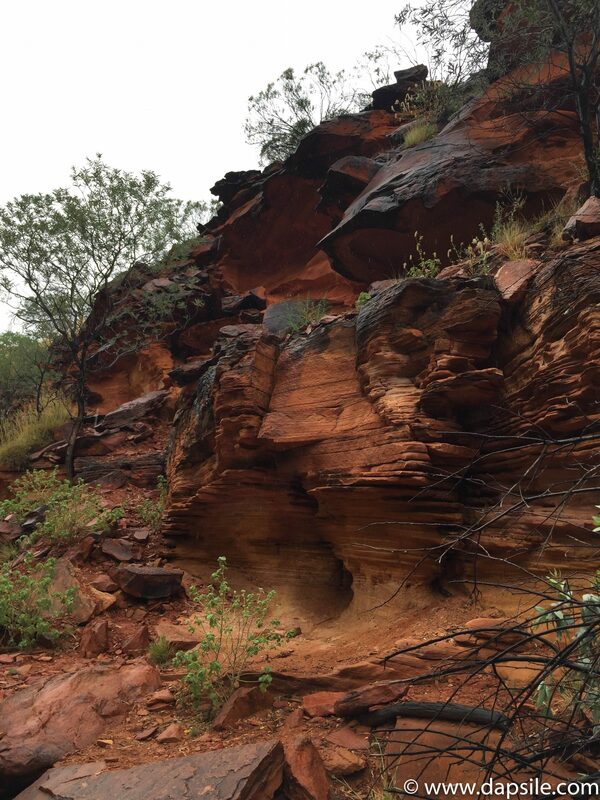 But there are some really interesting sites to see including a small waterfall, waterhole, and rock art. 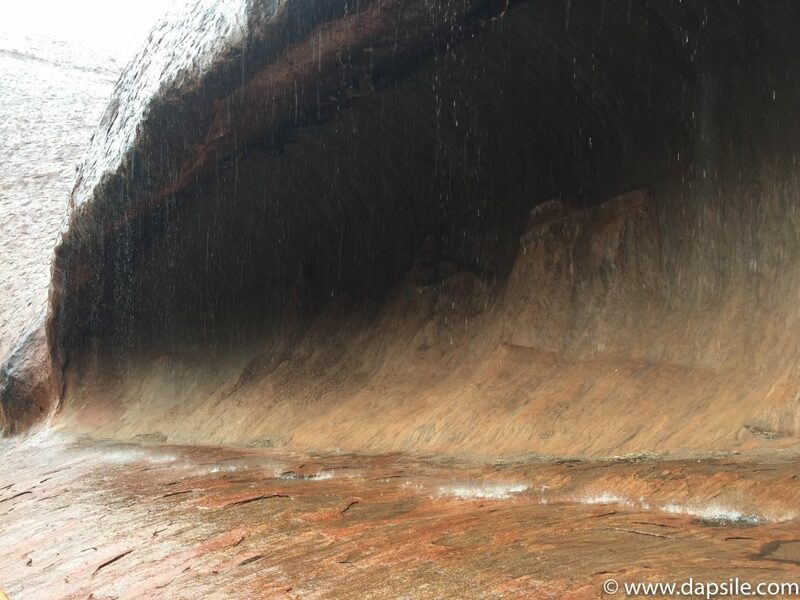 Plus, if like me you are there when it is raining, you will be fortunate enough to witness the rain transforming the rock. It really is spectacular. Spoiler Alert: the water falling off the rock, is quite warm. 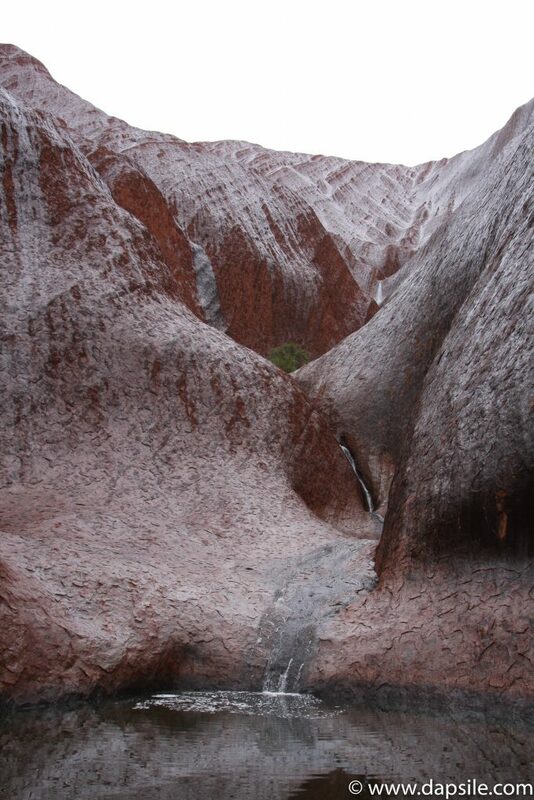 And, also contains a lot of gross things that animals excrete, as it washes and cleanses Uluru. The scene has been set, the highlight of the day, the breathtaking Uluru sunset with a glass of bubbly and a delicious Aussie BBQ. A spectacular day never to be forgotten. 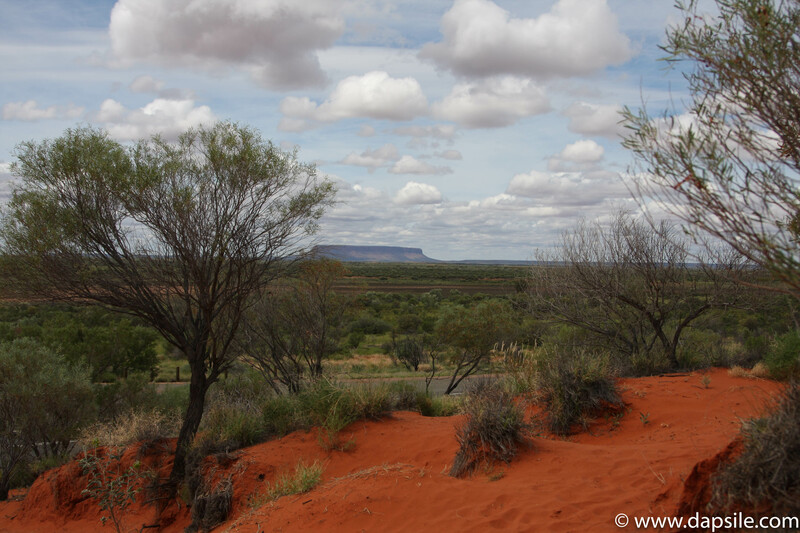 The bus stopped so we could look back at Uluru and take some pictures from a distance. 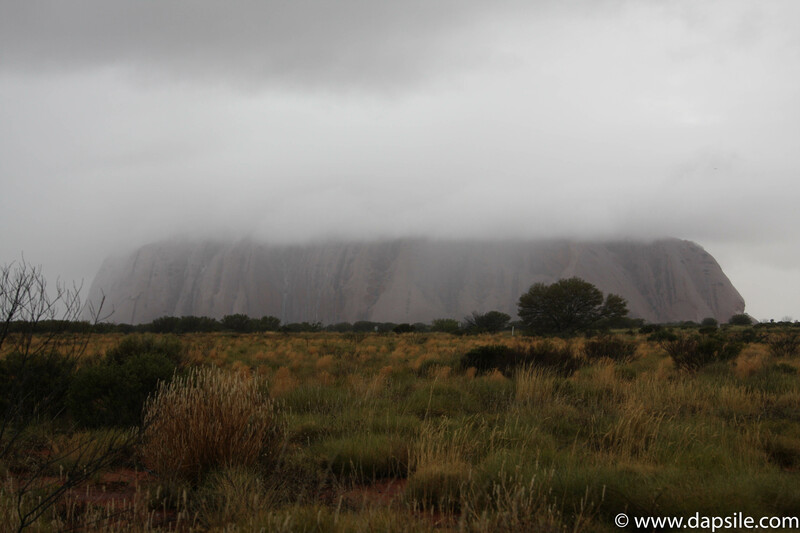 Then as we all hopped back on so we could be taken back to the Ayers Rock Resort, we noticed the clouds absorbing the giant rock. Earlier in the day we dropped off one of the guides so when we arrived in the camping area of the resort, he had everything set-up for dinner. There was a tent structure with benches and tables for us to sit in and after a short time we were served our buffet style dinner. There were even vegetarian hot dogs for all the vegetarians. Me, I was the vegetarian. We were served glasses of bubbly, or we could have juice, and for desert there was a pre packed slice of lamington cake. There were also leftover fruit slices. The website for the Ayers Rock Resort shows a wonderful aerial view of the entire resort (which I obviously did not see because I had no idea it was this big) and how close it is to Uluru. Perhaps on a nice day, with no rain, it would have been exactly like the Emu Run Experience website’s description; we would have eaten our dinner outside and had a stunning view of the sunset with the magnificent rock. After dinner, a few of us were dropped off at the Outback Pioneer Lodge within the resort. We were dropped off around 7:30-8:00 pm though so there wasn’t much time to do anything or even explore too much because pick-up the next morning was at bloody, crazy time of 4:00 am. It was such a wet day, I don’t think I really dried out. 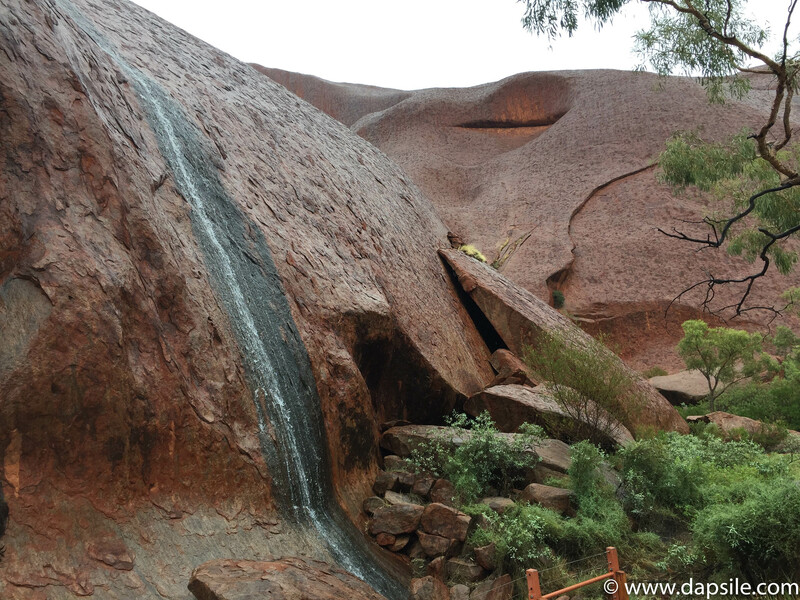 There wasn’t a lot of time between being dropped off at the Ayers Rock Resort in the evening on Day 1 and being picked up very early in the morning on Day 2 so I didn’t get to experience much there. I can tell you the staff was super helpful and friendly. Also the dorm room I stayed in was clean with the bedding supplied. There were no towels provided though. The large public women’s washroom area was well used and probably would have been cleaner if it wasn’t for the mass amounts of rain the area was receiving. Same goes for the shower area. Each shower had its own stall with locking door. When you walked into the stall there was an area with a bench and hooks on the wall and you continued through to the personal shower. AAT Kings was the tour operator for the second day of this tour, going to Kings Canyon. I was picked up at 4:00 AM. Myself and the others picked up at the Outback Pioneer Lodge, were not the first people to be picked up that day so I’m not sure where this tour originated or what time it started at. The bus was much larger and there were more people, but the tour guides were just as friendly and knowledgeable. Most of us slept on the bus until our first stop at Kings Creek Station for the included buffet style breakfast. There was a lot to choose from including meat, eggs, toast, cereal, etc. 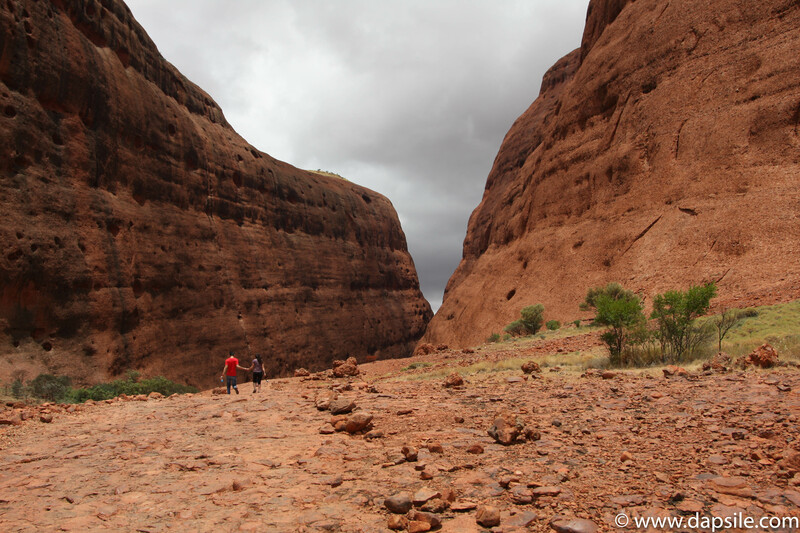 There are two different walks to choose from at Kings Canyon depending on your level and experience. The six-kilometer Rim Walk is the option for more experienced people. You climb a 100 metre cliff face and walk around the rim of the canyon. You get some really great views. I did the Creek Bed Walk. It is a casual two-kilometer walk along the creek bed. Please don’t think this means you can wear flip flops or something. You will still need a pair of supportive shoes with good traction. The views were really impressive and we were given a lot of incredible information from the guide on the plants and insects in the area. The Indigenous people have lived off the land for thousands of years so it is very interesting. Some things can be eaten or used in a completely beneficial manner, and of course, some things will kill you. Or injure you but the killing me part is what stuck in my head the most. 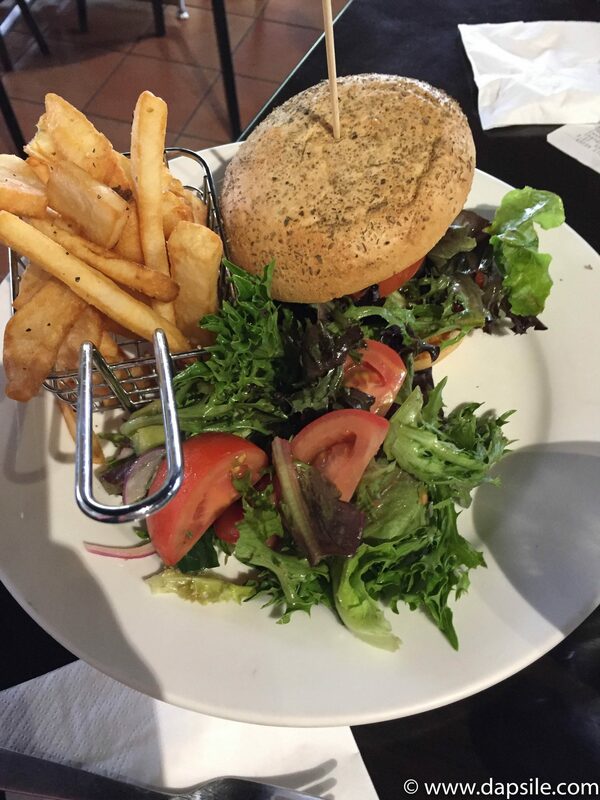 Those of us who did the Creek Bed Walk were obviously finished first so we were driven to the Kings Canyon Resort where we could walk around, explore, and buy lunch. The group that did the Rim Walk were brought back to the resort a little bit later but they were also given time to purchase and eat lunch before we all got back onto the bus. On our long drive back to Alice Springs we once again stopped at the Ayers Rock Resort, this time to exchange our guides/drivers. It was a long day. I was dropped off at around 7:30 pm and I was exhausted. I ate a bit of food, showered and was asleep a lot earlier than normal for me on Christmas Eve. It’s a good sign that I had a great two days on this tour. I enjoyed everything I was able to see and experience on this tour, but I also really appreciated everything I was able to learn. The knowledgable guides on both days, taught us how the Indigenous people of the area lived for thousands of years as well as the importance of the area to their culture. It was such an informative and unique experience. Mine just also happened to be quite wet. If you decide to travel somewhere and there is even a possibility of rain, I recommend a good waterproof phone case to protect your smart phone. I couldn’t use my DSLR much because of the rain so I took a few pictures with my phone. The rest of the time my phone was in the pocket of my rain jacket. My rain jacket stopped being waterproof somewhere over those two days. My seven-month-old iPhone not only got wet, it got water damaged and even stopped working. The screen went black, and I couldn’t turn it off to reboot the phone. I wasn’t able to set my alarm for the 4:00 am pickup on day 2 and I ended up standing in the bathroom at about 3:30 am with my phone under the hot air hand dryer. I was able to get it dried out enough so it basically worked again but it was on and off for days. I’m guessing it isn’t good for the phone though so I also don’t recommend holding your phone under a hot air hand dryer. Overall it was not a great experience. You don’t have a container of rice to dry out your wet smart phone when you are travelling. If you are interested in or starting to plan a trip, there are several travel related products and websites listed on the Yup…..We Like These page, to help you out. Some of the affiliate link descriptions also contain a coupon code for you to use.